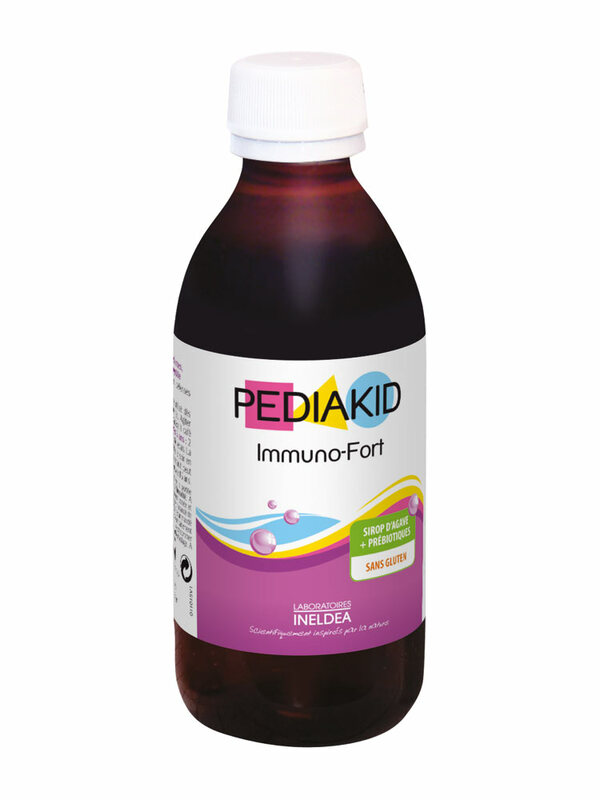 Pediakid Immuno-Strong Family Size 250ml blueberry flavor is a food supplement (syrup) allowing to support the whole defenses of the organism. Composed of extracts of Echinacea, Ginseng, Wild Rose Bay, Acerola, Rosehip, Broccoli, Vitamin C, Manganese and Copper, natural actives, this syrup participates to the immunity function and contributes to natural defenses of the organism. 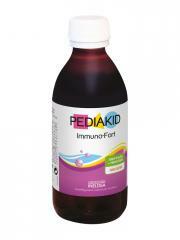 It is ideal in case of seasonal changes, periods with repetitive colds. Before 5 years old: 1 spoon morning and noon, after meals. After 5 years old: 2 spoons morning and noon, after meals. 1 to 2 months program. It is suitable for adults over 15 years old. Sirop d'agave 40%, eau purifiée, fibres d'acacia 15%, extrait hydroglycériné de plantes (acérola, brocoli, échinacée, ginseng, cynorrhodon) et propolis : 7.5%, glycérine végétale, concentré naturel de myrtille (support : maltodextrine), arômes naturels framboise et myrtille (supports : maltodextrine, gomme arabique), conservateurs : sorbate de potassium, benzoate de sodium ; vitamine C, gluconate de manganèse, gluconate de cuivre. Works really well for my kids.